Homepage. This page: A handbook and certificate issued by this commercial lorry driver's association in the 1920s. 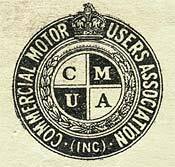 Commercial Motor Users Association for lorry drivers of the 1920s. This organisation existed in various guises until the 1940s, and it represented the interests of lorry drivers and those in road haulage across the UK. 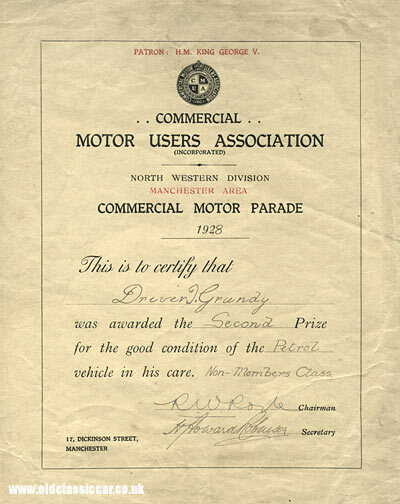 The North Western division of the Commercial Motor Users Association (CMUA) issued the certificate shown below, as part of its involvement in a commercial vehicle parade, held in Manchester in 1928. This driver, a Mr Grundy, received the Second Prize award for the good condition of his petrol-powered lorry (in the Non-Members class). A note on the back advises that he lived in Pemberton Street, Little Hulton. Sadly there is no mention of the make or type of commercial vehicle he drove. Some years ago I picked up the CMUA handbook shown below, quite a rare little book with a fold-over cover and clip. This was issued by the North Eastern division, based in Dewsbury, and is dated 1929, just a year later than the certificate. 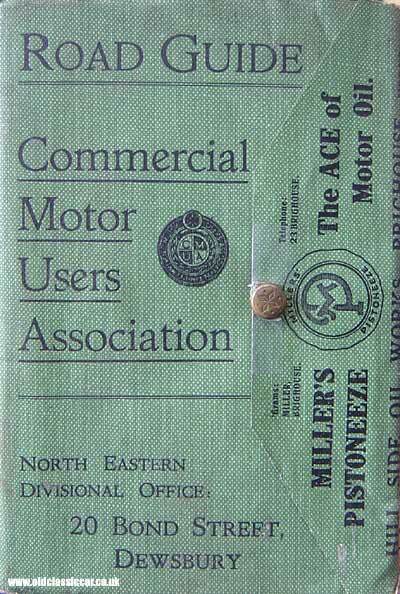 The external cover features advertisements for Millers Pistoneeze, "The ACE of Motor Oil", produced at the Hill Side Oil Works in Brighouse. The rear cover features the coachbuilder Charles Roberts & Co. Ltd., of Horbury Junction in Wakefield, with a drawing of a tri-axle omnibus. Within the fold-over front cover there are also advertisements for the Ryburn Garage steel trailers, and the 6 or 8 ton Saurer lorry, fitted with a Heavy Oil Engine which would "reduce your running costs by 75%". These Swiss lorries were available at Frank H. Dutson's distributors in Leeds, Bradford and Doncaster. Several cracking old adverts appear, all relating to motor-lorries in those vintage days. Firstly is a plug for Loroline Oils, a product of Sternol Ltd, with a full-page ad for "Motor Transport" magazine overleaf. The handbook describes how the CMUA supported the interests of anyone who owned or drove a commercial vehicle, and was also well placed to keep a watchful eye on any upcoming legislation that might affect the interests of it's membership. Additional benefits to members included legal & engineering advice, use of RAC Road Guides and telephone boxes, and a route planning service. General motoring tips and etiquette were also given, including details on road traffic signals, and tips on how to interpet hand signals given by police constables. There then followed a handy series of route maps, essential if you needed to traverse unfamiliar territory whilst behind the wheel of your lorry. After all, in the 1920s the road infrastructure was still an evolving art, with signage and surface conditions patchy to say the least, especially away from the major towns and cities. Lorry driving back then was proper hard graft, no air conditioning, power steering or sat nav for those early road users. Some of the vintage lorries featured in the handbook. 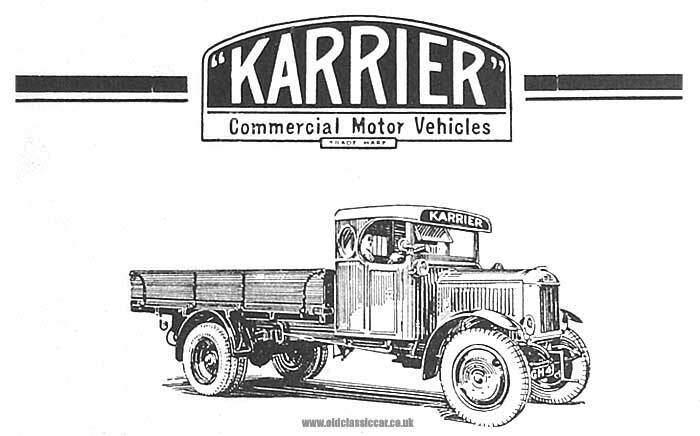 A sample of lorry illustrations found in this old handbook are shown next, starting with a Karrier drop-sided lorry. 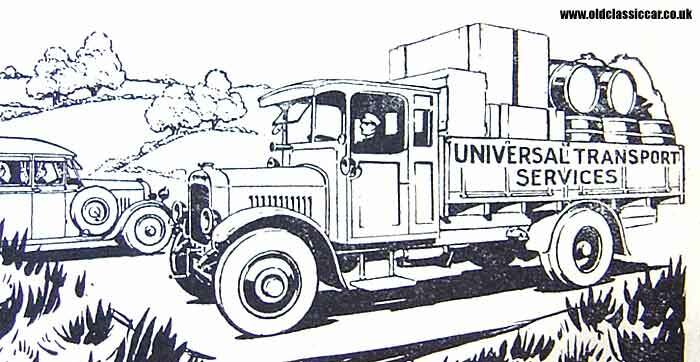 Next, an illustration of a fully-loaded Thornycroft lorry. The hand-operated tipper shown next was bodied by the Spenborough Engineering Company - Spendborough bodies were ".. stoutly constructed upon Oak Bearers and angle iron. Sturdiness is assured". And finally, an advertisement for Fielding & Bottomley coachbuilders included this drawing of a motor coach body, with full length roll-back roof arrangement.